A few weeks ago, The New York State Museum reached out to me to acquire a Bloomer Gown I had created to display in their upcoming exhibit Votes for Women: Celebrating New York’s Suffrage Centennial which runs from November 4, 2017- May 13, 2018 in Albany, New York. I was thrilled and honored to be apart of such a wonderful exhibit and celebration that I thought I would share a some details of not only the gown I made, but also the women who made the outfit popular. 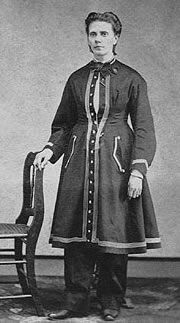 To start with the Bloomer gown, as we know it, was not first worn by Amelia Bloomer but actually by Elizabeth Smith Miller of Geneva, New York. 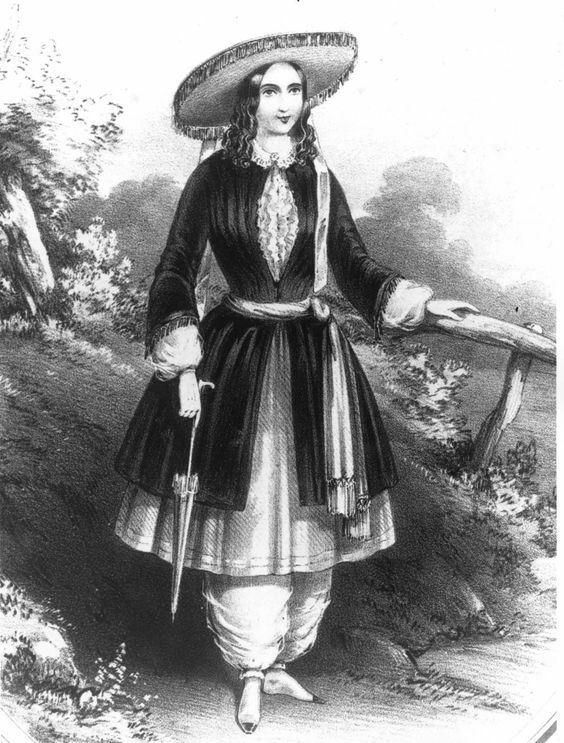 Elizabeth Miller, who advocated for dress reform using the Turkish style of pants, quickly caught the attention and support of Bloomer. With her newspaper, The Lily, which focused on women’s issues, Amelia popularized the look to the point where her name became associated with the gown. 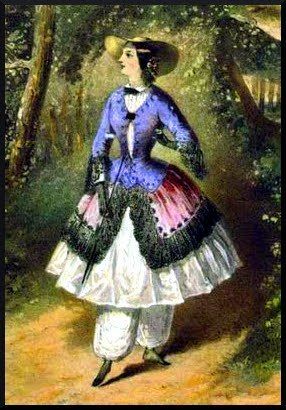 The outfit itself is composed of a gown with a short skirt which hits around the upper shin, and a pair of long, poofy pants. 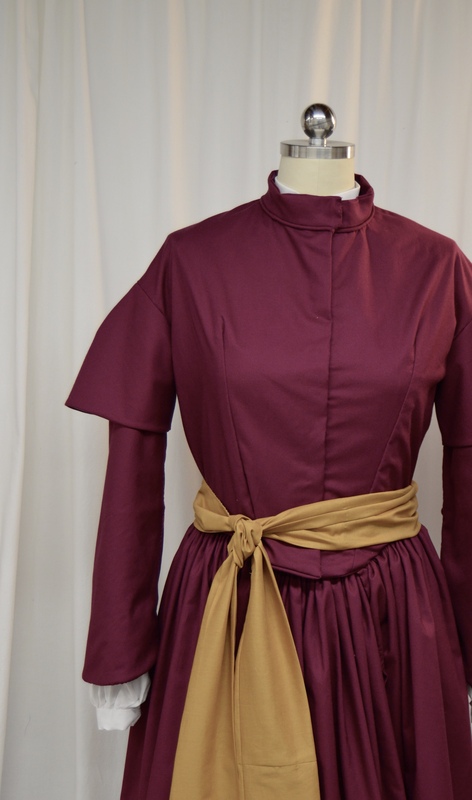 A bishop or pagoda sleeve is commonly used with either a blouse or under sleeves used to provide the needed modesty. 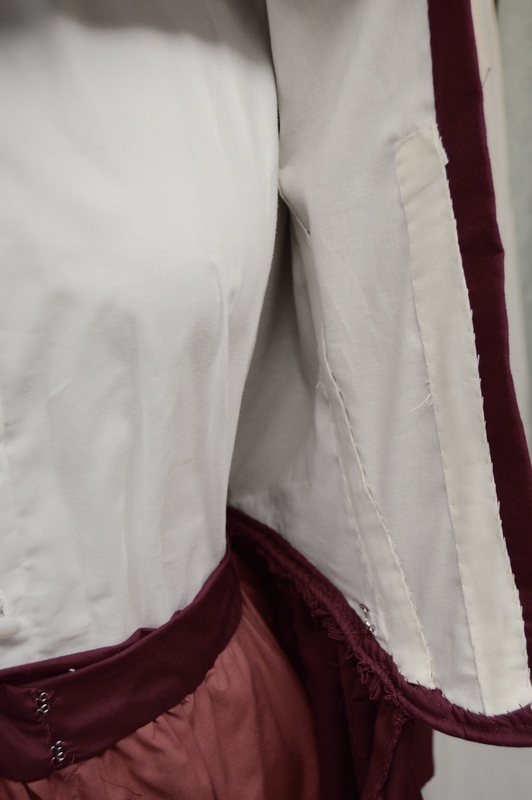 The bloomers themselves are gathered in to a cuff that hooks around the ankle and, like the majority of bloomers at this time, are crotchless. 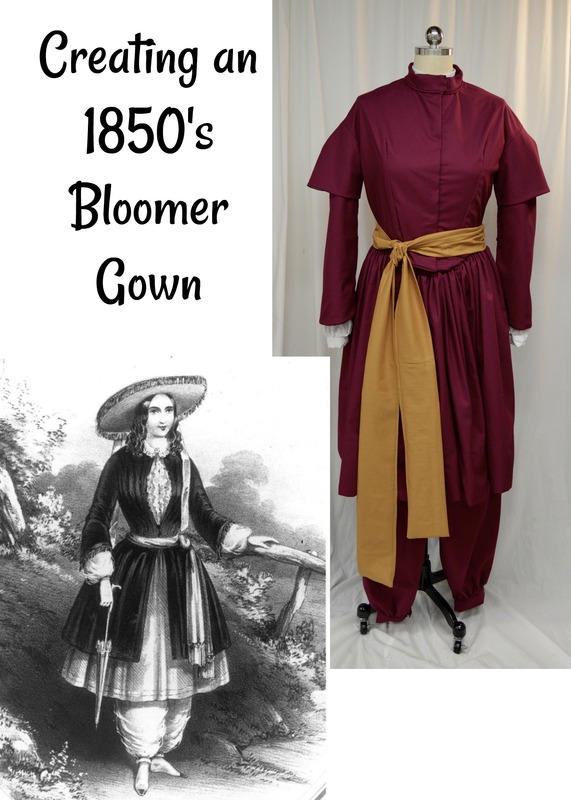 Here are a few examples of various takes on the Bloomer Gown. So now for my look. I used the pattern #811 by Past Patterns which includes instructions for both the Bloomer gown and an 1850’s gown..which is pretty much the same thing with just a longer skirt. 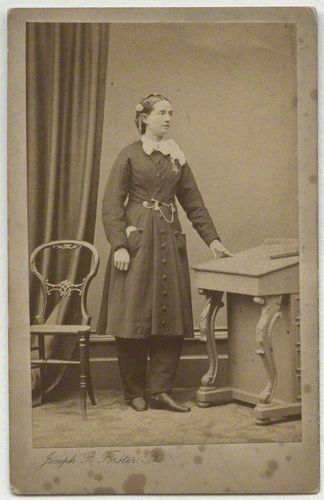 Instead of using under sleeves, I put a Garibaldi blouse in white underneath and also included a sash. For my gown, I opted not to do the rushing as the cotton I used just wasn’t working quite right. 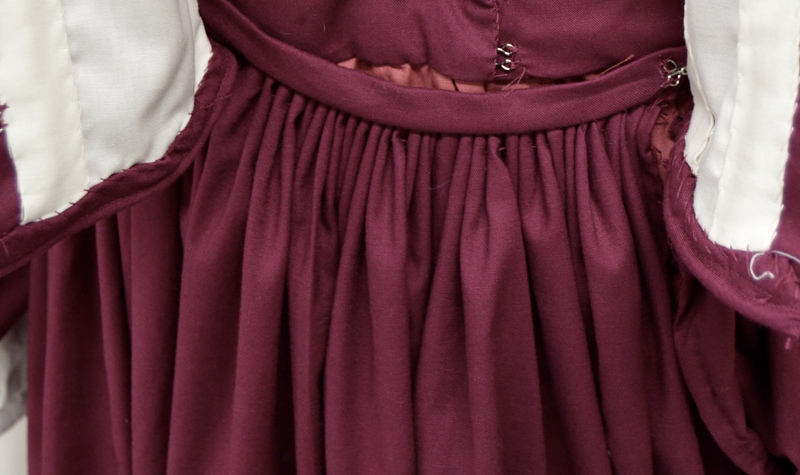 The gown hooks in the front with hook and eye closures, has sewn in boning, and also features a skirt apron of sorts which consists of a mini waistband that is free of the bodice, covers the center front, and hooks to the side bodice. 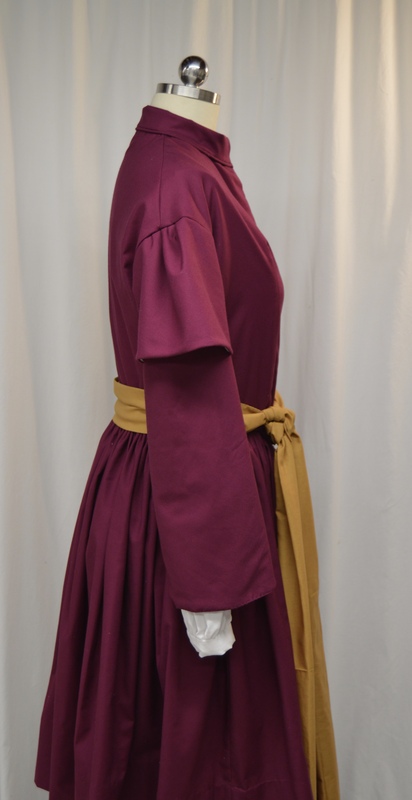 ***see picture below*** The skirt itself is cartridge pleated and hand stitched to the bodice. 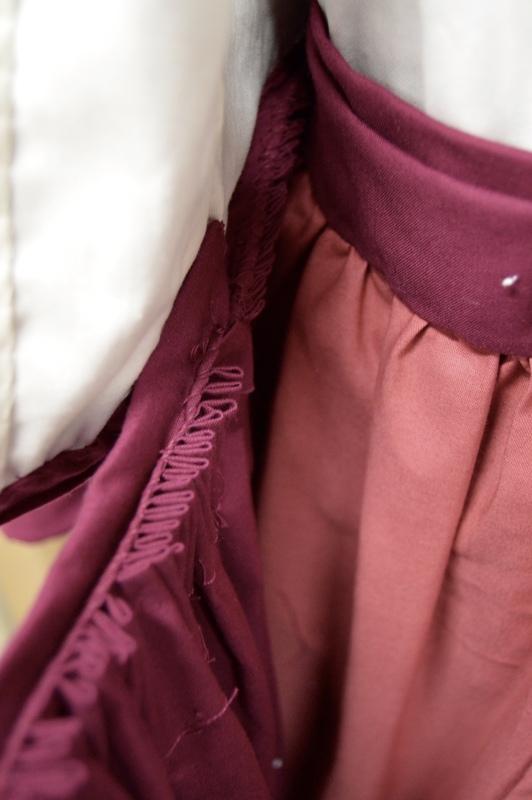 The bloomers are held main fabric and half lining fabric, gather into a waistband and hook in the front. This outfit was such a fun and different project! 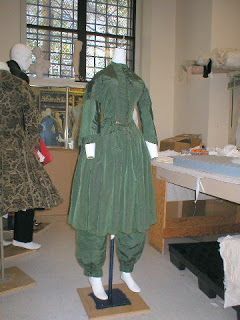 I am so glad that it will get some great use at the exhibit and will help educate others on the heroism and fashion sense of some wonderful historical women! 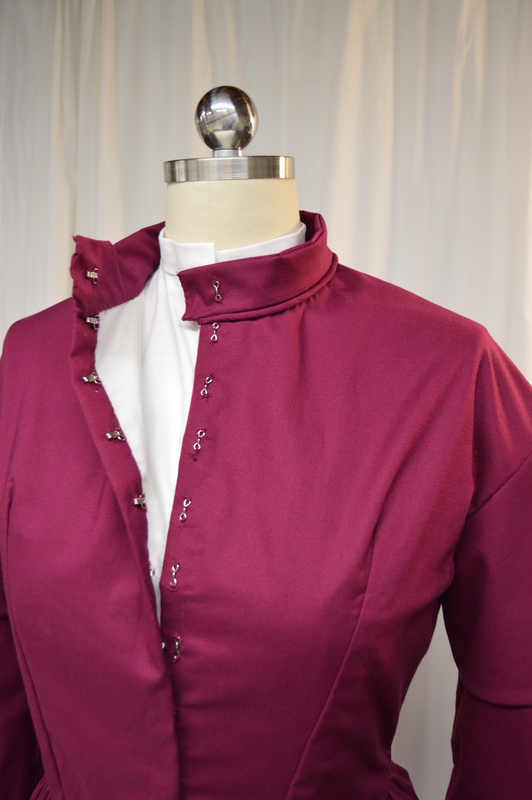 In case you missed my previous post, I am currently looking for historical seamstresses and tailors to create ready-made and custom historical clothing for both men and women! If interested, please click HERE. You’re welcome! You did an excellent job! Congratulation on being in this exhibit. How exciting! I think you’ve created a wonderful piece.